The Barney Bear series are excellent edutainment titles aimed at teaching the basics of various subjects to toddlers aged 1 to 4 years old. Aside from being some of the finest titles ever made for this (some would say hard to please) target group, the games are notable for using SBTalker, Creative Labs’ proprietary text-to-speech program that shipped with early versions of Sound Blaster card. The narrator in all Barney Bear games therefore sounds exactly like that mechanical, HAL-style voice of Dr. Sbaitso, a program shipped with SBTalker to showcase its capabilities. 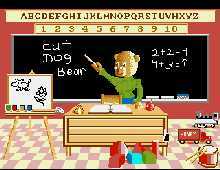 Each Barney Bear title focuses on one subject, and features Barney, a cute Teddy bear, as the player’s companion and star in the stories. For example, in Barney Bear Goes to School, kids will learn rudimentary algebra, pattern recognition, and what an experience of going to school might feel like. In Barney Bear Goes To Space, kids will learn the basics of space travel and objects in space. Every Barney Bear game offers two modes of play: story, and game. In story mode, a story involving Barney and the topic will be shown in attractive scenes, all fully narrated. Kids can interact with various "hotspots" on the scene before flipping to the next page. In game mode, all the activities are laid out and presented in one place, where kids can easily jump from one to the next. What makes Barney Bear games special is not only the excellent presentation that will capture kids’ attention, but the near-perfect balance between game and information in each title. In Barney Goes to Farm, for example, kids will watch an animated story of how a seed grows into a tree, asked by the game to count the number of apples in a scene, and learn how to milk a cow. The game sets a fine balance between honing kids’ basic skills, letting them learn interesting knowledge, and offering them fun activities to do. In short, these are some of the best games for toddlers ever designed, although they were much less known than titles from big companies. And kids will probably find the inhuman SBTalker voice even somewhat amusing. Highly recommended!